Providing high-net-worth individuals, corporations and family offices with the insight and expertise they need to confidently navigate the purchase of their next pre-owned private or business aircraft. 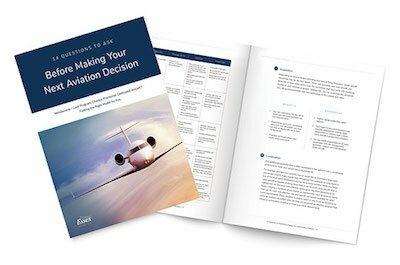 There are several important considerations to take into account when entering into aircraft ownership. At Essex Aviation, we assist clients through the entire process, from initial evaluation of the most suitable aircraft all the way through to the final acceptance, delivery and closing. There are many choices when it comes to aircraft ownership — starting with the decision to purchase a brand-new aircraft that lets you fully customize the design or opting for a white-tale aircraft, which has already been designed but gives you quicker entry into service. The team at Essex assists clients in evaluating different aircraft options based on their specific needs and desires — including a technical and financial analysis to ensure the right aircraft and aviation utilization models are considered. Once an aircraft type has been identified and assessments are complete, Essex assists clients with the entire design phase, from attending all design meetings with the OEM design team to final design approval. With a final and approved design, aircraft production is ready to commence. Essex manages and oversees the entire production process. When the aircraft is ready for final acceptance and delivery, Essex has the experience and expertise to ensure the entry into service process runs smoothly and clients expectations are completely satisfied and achieved. Essex’s clients receive thorough consultative services that cover every aspect of new aircraft ownership.